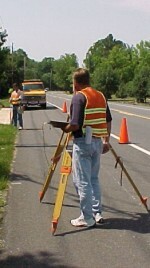 The Maryland Department of Transportation State Highway Administration (MDOT SHA) routinely performs many types of surveys in support of highway design and construction and creates right-of-way plats for property acquisition. Click here for Drafters Checklist for MDOT SHA Plat Submissions. Contact the Office of Real Estate at 888-204-4245 for the latest research request forms. Obtain Construction As-Built Plans from the MDOT SHA Office of Highway Development. Click here to download Construction As-Built Plans Request Form (Zip. 230 kb). MDOT SHA’s safety guidelines include manuals and enacted laws. These guidelines apply to all MDOT SHA personnel and consultants working on Maryland roadways. For a current, comprehensive list of MDOT SHA’s Safety Policies visit Work Zone Safety and Mobility.